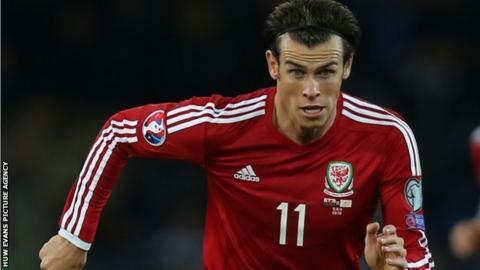 Real Madrid's Gareth Bale insists the pressure will be on Belgium rather than Wales in Sunday's Euro 2016 qualifier. Wales travel to Brussels as unbeaten Group B leaders but will be up against the group favourites and World Cup quarter-finalists. Bale, 25, is in Chris Coleman's squad after recovering from injury. "I feel that there's not so much pressure on us to win. The pressure is on Belgium - they're [ranked] fourth in the world," Bale said. "We know it's going to be a difficult game against Belgium but one we're looking forward to. "We're going to go over there and give it our best shot. We got a result against them away last time so we're looking forward to doing the same." Bale was absent through injury when Wales held Belgium to a 1-1 draw in a World Cup qualifier in Brussels in October 2013. The former Tottenham player had not played in any of Real Madrid's five matches since October's international break because of a buttock muscle injury. But Bale, who has been nominated for the 2014 Ballon d'Or award, made his comeback against Liverpool and started and scored in the 5-1 win over Rayo Vallecano. He now joins up with a Wales squad which has made an impressive start to the Euro 2016 campaign with wins over Andorra and Cyprus and a draw against top seeds Bosnia-Hercegovina. "The character in the dressing room is good," Bale told BBC's Football Focus. "We've all been playing with each other for the last five or six years and know each other inside out. "I think it was important for us to get off to a good start in this campaign, which we did [against Andorra]. "We backed it up with another win and a draw, which were good results, especially in the circumstances of being down to 10 men against Cyprus. "I love playing for Wales and representing my country. For me it's the ultimate honour." Wales squad: Wayne Hennessey (Crystal Palace), Owain Fôn Williams (Tranmere Rovers ), Danny Ward (Liverpool), Ashley Williams (Swansea City), James Chester (Hull City), James Collins (West Ham United), Ben Davies (Tottenham Hotspur), Paul Dummett (Newcastle United), Neil Taylor (Swansea City), Sam Ricketts (Wolverhampton Wanderers), Chris Gunter (Reading), Adam Matthews (Celtic), Danny Gabbidon (Cardiff City), Emyr Huws (Wigan Athletic), Joe Ledley (Crystal Palace), Joe Allen (Liverpool), Aaron Ramsey (Arsenal), Lee Evans (Wolverhampton Wanderers), Hal Robson-Kanu (Reading), David Cotterill (Birmingham City), George Williams (Fulham), Tom Lawrence (Leicester City), Jake Taylor (Reading), Gareth Bale (Real Madrid).